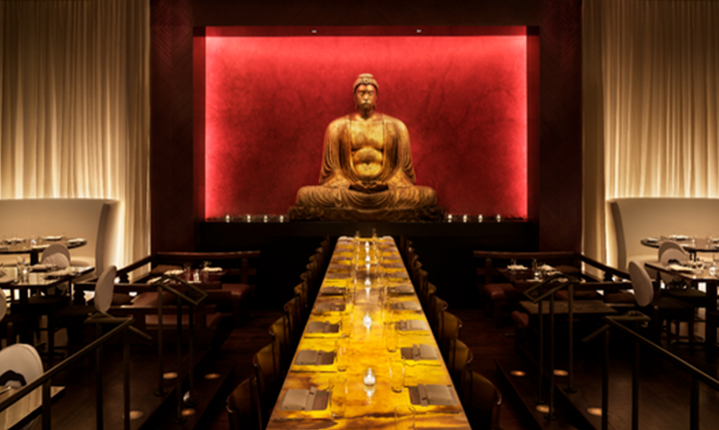 The next time you are in Philadelphia be sure to enjoy a wonderful dining experience at Buddakan. This Asian fusion restaurant has delicious food, a wonderful atmosphere, and spot on customer service. When you come in, start your meal off with a savory appetizer like their Kobe beef sliders, miso soup, or the tuna pizza that is comprised of tuna carpaccio, spicy aioli, pickled jalapeno, and ponzu sauce. Another solid starter is the Thai chicken salad that has Napa cabbage, watercress, and crispy rice noodles. For your main course, Buddakan offers Dim Sum, noodle, rice, vegetable, fish, poultry, and meat options. Some fan favorites include the crab and lobster dumplings, the Korean beef fried rice, Chinese eggplant, pan seared sea bass, the five spice duck breast, and the wasabi-crusted filet. If you manage to save room for dessert, the Chocolate Bento Box is out of this world. This treat comes with a strawberry ice cream macaroon with dark chocolate, chocolate banana decadence, white chocolate cheesecake, chocolate pot de creme trio, white chocolate lychee mousse with rose gelee, and dark chocolate raspberry truffles. So stop in at Buddakan the next time you are downtown and see why this dining venue has become so popular. They are located at 325 Chestnut Street in Philadelphia. For more information, call (215) 574-9440 or visit their official website by clicking here.